Posts Tagged "Handwriting Without Tears"
Learning Without Tears’ Handwriting Without Tears (HWT) is a comprehensive handwriting product for grades K-5. Core content is available in print format. Digital teaching resources also are available. This review is of print resources only. Instruction focuses on printing skills in grades K-1 and cursive writing in grades 2-5. HWT is available in English and Spanish and includes developmentally appropriate visual, tactile, auditory, and kinesthetic activities that build handwriting skills. 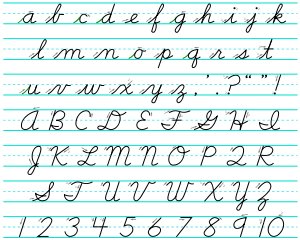 Is Handwriting Better Than EdTech in the Classroom? As 1-to-1 and BYOD* initiatives proliferate in K12 education across the country, keyboarding skills increasingly are taking precedence over handwriting instruction in elementary school classrooms. Perhaps the greatest indicator of the shift away from handwriting is the attention given to keyboarding proficiency in the Common Core State Standards. The CCSS, which have been adopted in most states, call for instruction in legible writing in kindergarten and first grade, but emphasize keyboarding skills in second grade and beyond. However, psychologists warn that handwriting is an important skill that has wide benefits in supporting student learning at all ages. For example, a 2012 study by Karin James, a psychologist at the University of Indiana, demonstrated that the practice of handwriting shapes brain development in ways that support the acquisition of reading skills in young children. In June, Scientific American cited a 2014 study by psychologists at the University of California Los Angeles and Princeton found that college students who took notes using longhand had better retention and understanding of lecture information than students who took notes on laptops. The authors argue that that the process of writing allows students to process and frame information in ways that support memory and understanding. In light of these findings, educators may want to seek a balance between instruction in keyboarding and handwriting skills, particularly in the elementary grades. Educators considering such a balance may be interested in Learning List’s recent review of Handwriting Without Tears (HWT). HWT is a comprehensive handwriting curriculum for grades K-5 that focuses on printing skills in grades K-2 and cursive writing in grades 3-5. Across grade levels, handwriting instruction is provided in 15-minute periods that integrate learning to write with instruction in other subjects, particularly language arts. Teacher’s guides provide support for integrating reading (e.g., encoding and decoding) and writing skills (e.g., composing words, sentences, and paragraphs) with handwriting instruction and include engaging and developmentally appropriate activities at each grade level.